We're celebrating those juicy, sweet yet healthy fruits that make winter so sunny! That's right - it's time for the Cuties® Clementine! Its harvest season is from late October through February - for 100 days, so grab your fair share of Cuties® now from your local grocery store! We want to make sure that you know what’s good for you in store this season. The history of the Clementine was more of an accident than a discovery. A hybridization happened in the backyard of an orphanage that was taken care of by a man named Brother Clement Rodier. Based off of his discovery, the fruit was then named Clementine in both English and French. Another theory behind the Clementine is that it originated in China much earlier than that. It is almost identical to their widely gown mandarin oranges. What we do know for sure is that Clementines were first grown in the United States in the early part of the 20th century - right there in sunny California. Due to being highly nutritious, the clementine fruit has countless health benefits to offer. Clementines contain vitamins A and C as well as essential sugars, calcium, folic acid, and potassium. Clementines are also highly beneficial for the human skin. Speaking of skin, they help in eliminating blemish-causing bacteria and boost the production of collagen, thus rendering you a crystal-clear, healthy skin. One serving of clementine supplies a full day's supply of vitamin C. Wow! Their good source of foliate also helps strengthen healthy red blood cells. They are also low in sodium so a diet that includes clementines may reduce the risk of high blood pressure. If you want USA home grown Clementines we highly suggest Cuties®. Always sweet and easy to peel, Cuties® are one of the best natural snacks there is. Packed full with vitamins and seedless on the inside, they are easy to eat and easy to bring anywhere. 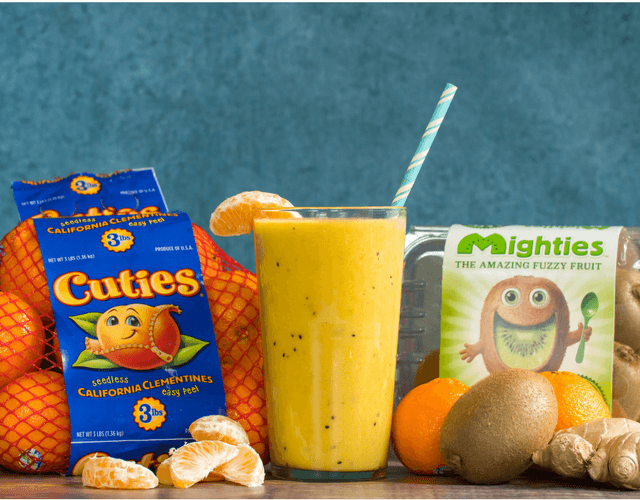 California grown and handled with care, check out the Cuties® website to see which grocer has them available near you! Ready to incorporate more healthy clementines into your diet? Try this easy, immune-boosting recipe! Easy and delicious - and packed with perfect health for you!